Ever wondered what manta rays do when we’re not looking? For the first time, researchers have glimpsed the secret life of reef manta rays in the northern Great Barrier Reef. 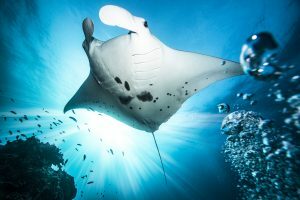 In a world-first, one manta ray was fitted with a satellite tag in the waters off Cairns – thanks to a large collaborative effort between the Biopixel Oceans Foundation and Project Manta (based at UQ) – and its movements were tracked for six months. View Video. Project Manta has been studying manta rays in southern Queensland for over a decade using a combination of citizen science photography and researcher tagging to identify and follow different rays. Southern Queensland manta rays migrate seasonally and often gather in large numbers off Lady Elliot Island and North Stradbroke Island. Our years of continuous monitoring suggest that the more elusive mantas of northern Queensland may be a separate population. Manta rays may seem like large, obvious animals, but the first challenge for researchers keen to learn more about the northern rays’ movements was to find one within the massive area of the northern GBR. That search involved a plane, a boat, a drone and then a snorkeller. An aerial survey (supported by GSL Aviation) located a manta ray among the multiple coral reefs off Cairns, and relayed this information to a boat-based research team who travelled to the reef, sending up a drone to pinpoint the position of the manta. Finally, a researcher on snorkel was able to attach a tag to the manta ray. After a long six-month swim with the ray, the tag detached as programmed, floated to the surface and began to transmit its location and some of its stored data to satellites overhead. Released in the waters north of Cooktown, the tag washed up on a remote and rugged stretch of beach near Hope Vale, below the Cape Bedford peninsula. The next challenge for the researchers? How to recover the tag. The tag (a Wildlife Computers MiniPat) has an oblong shaped body about 10cm length with a 20cm long antenna. Although the tag itself is worth a few thousand dollars, the data collected and stored in its memory over its travels is priceless. The research team contacted the Elim Beach Campground, located on the other side of the Cape Bedford peninsula and Frank Lowie answered the call. For three days, Frank headed out in his beach buggy at low tide to search for the device, armed only with the last known satellite location. Given the size of the beach and the amount of debris to sift through, this was a needle-in-the-haystack situation, and Frank came home empty-handed each time. The team turned to Tai Inoue, from Biopixel, sending him north with a special piece of equipment borrowed from Adam McKeown, CSIRO in Cairns: a manual tracking device with a sensitive directional antenna and receiver to decode the satellite transmissions (goniometer). 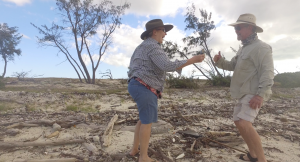 Tai joined forces with ranger Barry Lyon and his wife Shelley from Cooktown – keen beach fossickers familiar with the region. They reached the beach for the afternoon’s low tide and began their search from the last satellite transmission site. 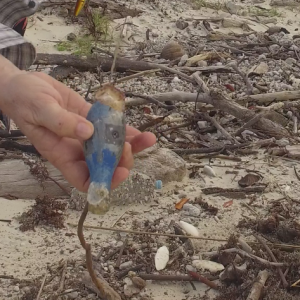 After two hours of following goniometer readings along the beach – and with daylight fading – Tai spotted a bright blue 10-cent coin-sized object in the sand. It was nestled at the high-tide mark between a wetsuit and two mackerel lures… and was the only part of our tag that was visible! Too far from home to make the return trip, the triumphant trio camped behind the sand dunes for the night before driving south to deliver the tag to the researchers in Cairns. Tags do transmit some useful information for a while after detaching from their hosts, but the resolution is coarse and signals are often corrupted. Retrieving this tag allowed researchers to download amazingly detailed data that would otherwise have been lost – most excitingly, recordings of temperature, light level and depth every 3 seconds for its entire deployment. This information can be used to estimate the manta ray’s position throughout the six months it was tagged, and preliminary results suggest that this manta was a north Queensland local for that entire period, moving between Townsville to the south and Cooktown in the north and making several deeper dives (down to 400m!) off the edge of the continental shelf. This supports the idea that northern Queensland’s manta rays behave as a separate population to those further south. A new round of tagging research will get underway later this year in north Queensland on both the eastern and western sides of the Cape York. This work will accompany more photo-identification studies to compare individually identified animals between different Australian and regional sites and Project Manta encourages photographs and reports of sightings of manta rays. There’s still a lot more to learn about where manta rays go, and what they do, and these studies offer researchers an exciting way to take those journeys with them. 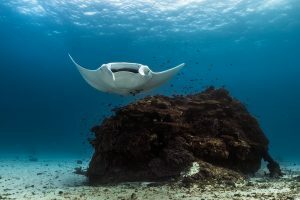 The University of Queensland’s Project Manta is funded by an Australian Research Council-Linkage Grant, Austral Fisheries, TJ Kailis Marine Conservation Fund, and Lady Elliot Island Eco Resort. (https://biomedical-sciences.uq.edu.au/project-manta). The Biopixel Oceans Foundation/James Cook University Megamouths project (http://biopixelresearch.org/research/megamouths/) is funded through the Run for the Reef Marathon (https://www.greatbarrierreefmarathon.com.au/).